Image Size: 27" x 15 1/2"
and Roger A. Haberman, Lt., USMCR. In the South Pacific, WWII was fought in miserable conditions against overwhelming odds with minimum equipment, men, and supplies; generating real heros in all ranks. On Jan. 25, 1943, one such hero, Capt. Joe Foss, led his "Flying Circus" squadron of eight plus four P-38 Lightnings in a "brilliant tactical maneuver" that saved Henderson Field on Guadalcanal. Forseeing a massive aerial enemy attack, Foss and his men flew out to meet an approaching armada of over 100 bombers and fighters and played hide-and-seek with them between cloud layers. 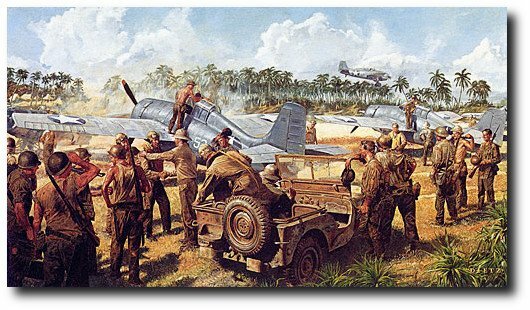 Tricked into thinking they were outnumbered, the enemy planes eventually gave up and headed back up the slot toward their home bases on Bougainville and Munda. Everyone at Hendersen was counting as the "Flying Circus" returned. Twelve had gone up and here were - three, five, six, nine, ten, twelve back! Lieutenant Colonel Sam Jack, Commanding officer of the fighter strip and himself one of the finest fighter pilots and aerial tacticians in the service, gathered the twelve pilots together as they climbed from their cockpits. What had happened? It was Joe Foss all the way - Foss and his generalship. Colonel Jack, his superior, and the men who fought under him, said unanimously it was only his shrewd leadership and knowledge of combat tactics that saved the Americans and their precious airfield from a hail of destruction. It was Joe Foss's farewell to Guadalcanal.